Artist Mark Vallen's essay on Otto Dix. Based upon his own war time experiences in the trenches of the First World War, it was art like this that got Dix in so much trouble with Germany's right-wing. The central panel of the triptych shows the devastation and appalling misery of the battlefield as the artist remembered it. Dix painted this work using egg tempera and oil on wood. The painting shows a village shattered and smoldering, trees blasted into splinters, and everywhere... soldiers, and parts of soldiers, decomposing in the mud. A soldier's bare white legs can be seen sticking out of the putrid morass in the upper right corner, and a desiccated corpse impaled on twisted steel bars hovers above the scene of carnage and despair. Dix created many such artworks based on his wartime memories, and rarely has the world seen such brutally honest statements concerning the reality of war. At the time Dix painted The War Triptych, the ruling elites of Germany were attempting to popularize militarism. Fascists were promising to rebuild Germany with "Blood and Iron", it was not a time for pacifist images. A year after Dix created this painting Adolf Hitler came to power. Dix was accused by the Nazis of creating art that sapped "the will of the German people to defend themselves." The artist was immediately fired from his teaching position at the Dresden Academy of Art and he was prohibited from exhibiting his works. Instead, the Nazis included the works of Dix (and other Expressionist artists) in propaganda exhibits designed to denigrate modern art. Dix was ridiculed in no less than three such exhibits, the Reflections of Degeneracy show (Dresden 1933), Art in the Service of Demoralization (Stuttgart 1933), and the infamous Entartete Kunst ("Degenerate Art") exhibit of Munich 1937. 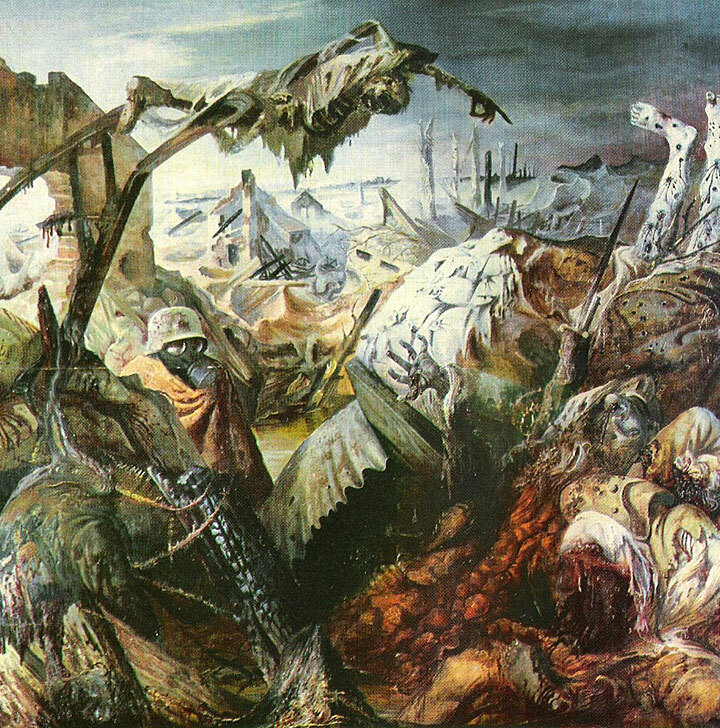 The War Triptych was based upon an earlier work, the 1923 painting Der Sch�tzengraben (The Trench), which had previously been seized by the Nazis and most likely destroyed by them. www.art-for-a-change.com is owned and operated by Mark Vallen � All text by Mark Vallen.